Although the SAFERIDER project has finished and the Throttle Control was withdrawn from the Project, the UKs Motorcycle News has reported on Throttle Control with a quote from Right To Ride. But a watchful eye needs to be kept on the development of all systems that take control away from the rider! The shortened article, which we have reproduced below, from the printed version is posted on the Motorcycle News website . A bike throttle which gets stiffer to force the rider to slow down has been developed in a European Commission research project. The system uses an electric motor attached to the throttle cable to increase stiffness when an onboard computer calculates the bike is going too fast. It could be used, along digital maps and GPS, to prevent speeding or slow riders for corners. MCN recently tested a Triumph Sprint ST equipped with similar a system which warns the rider when his cornering speed is deemed too fast using an alarm inside the helmet and a vibrating glove. 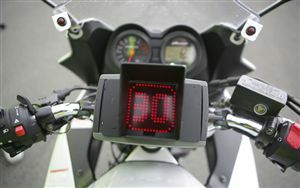 The so-called Curve Warning System calculated maximum recommended speed for bends on a test track using GPS and pitch sensors in the bike. Our tester found it distracting and over-cautious. The ‘force controlled throttle’ system has been fitted to a motorcycle simulator in the same three-year EC project, called Saferider. The project was backed by Fema (Federation of European Motorcyclists’ Associations), Yamaha and Mira (Motor Industry Research Association). A report produced by the Saferider project said a motorcycle ‘will be equipped with a force controlled throttle able to tune the return force through a servo controlled electric motor in order to communicate a speed reduction warning.’ It said the throttle ‘is designed for a non invasive and highly intuitive feedback’.